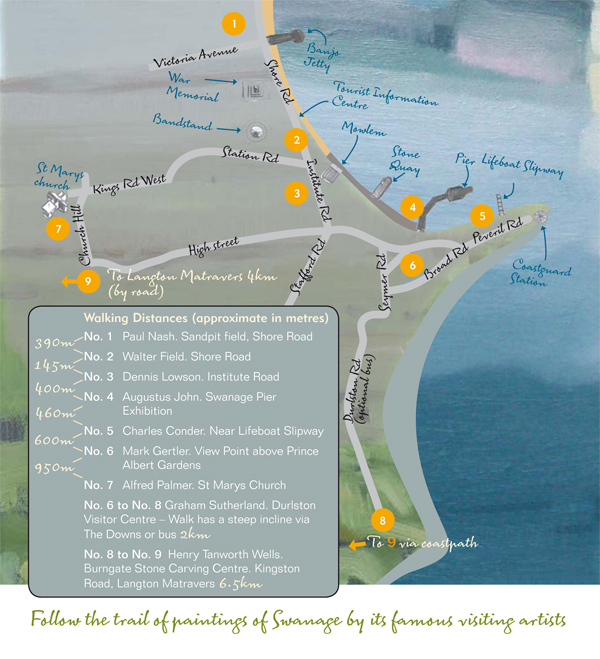 Walk the Walk and listen to the Talk, Swanage Seen Art Trail. 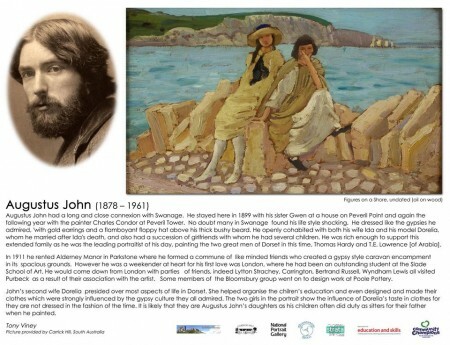 This Sunday 20th September 2.30 pm at the Learning Centre, Durlston, I shall be giving an Illustrated talk about the artists in the trail and their connection to Swanage. Also on Thursday 24th Sept, a Guided Art Trail Walk for the Swanage and Purbeck Walking Festival Meet at the Swanage Tourist Info Centre, Shore Rd, 10am. 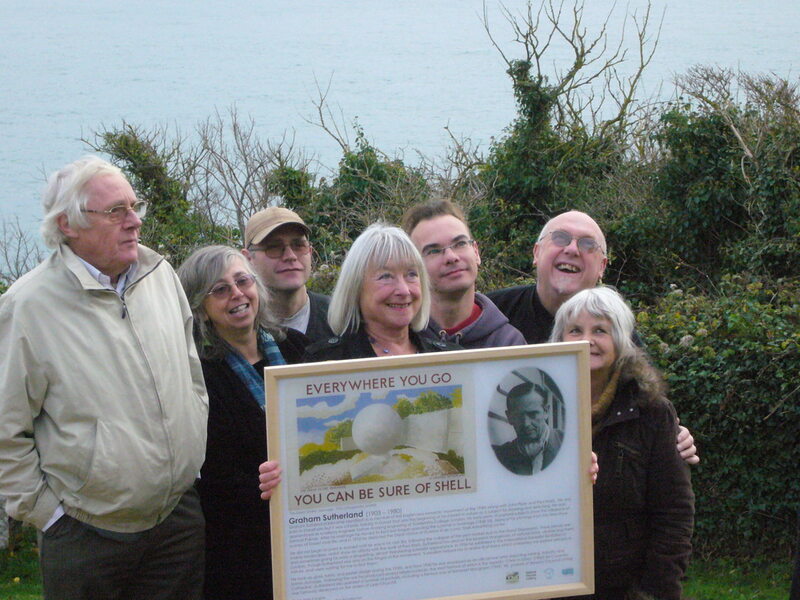 We were thrilled with the launch of The Swanage Seen Art Trail on Saturday 5th December. The weather cleared and many people gathered on the terrace above the Prince Albert Gardens where the Mark Gertler panel was sited. His son, Luke, came especially down from London to open the event with a very interesting account of his father’s time in Swanage. 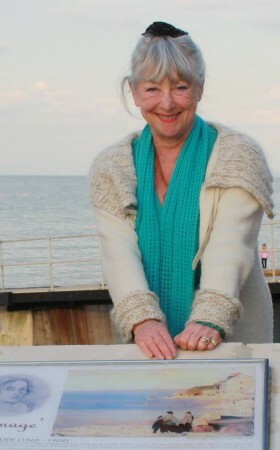 Pennie Denton, author of Swanage Surrealism, who wrote the biography of Paul Nash, the next board on the trail, in the Heritage Centre, spoke of Nash’s connection to Swanage. Present too, Oliver Field, and his son Robert, descendants of Walter Field RA, whose painting ‘Come unto these Yellow Sands’ is depicted on the panel in Shore Road. Oliver gave enlightening account of his Great Grandfather’s life and times. Jim Knight MP arrived and after an enthusiastic introduction, cut the ribbon and announced the Art Trail open! After celebratory drinks at the Art Hut, we followed the trail to the Heritage Centre, Paul Nash. Then to Shore Road where Oliver Field cut the ribbon on the Walter Field panel and spoke some more about his famous relative. On to the Denis Lowson art panel in Institute Road, Carlotta Barrow who had known Denis since the ‘50s told us about his life and work. The rest of the Art Trail boards were on display in Totally Local, Commercial Road. The Graham Sutherland panel was on loan from Durlston Castle, Charles Conder, Augustus John and Alfred Palmer. 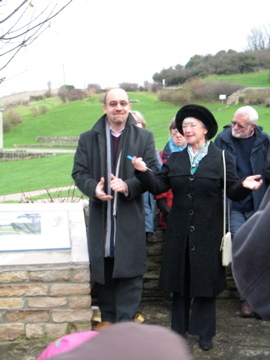 The Henry Tanworth Wells panel on display for the first time is to be sited at the Burngate Stone Centre, Langton Matravers. Grateful thanks to Cobalt Corporate Finance, Strata, Swanage Town Council, 4Matt Framers, Keates Quarries, Community Champions and all sponsors. The Henry Tanworth Wells Art Panel ‘The Quarrymen of Purbeck’ is now completed, it was sponsored by John & Sarah Wootton of Tom’s Field Campsite. The Painting is in the collection of the Guild Hall Art Gallery, they have kindly let us reproduce it, the self portrait is from the National Portrait gallery. 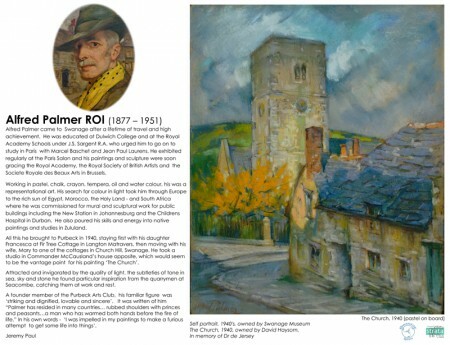 Jeremy Paul has writen the biography, it has been a challenge to find the connection to Purbeck Quarrymen by this Victorian Society Portrail Painter! It was Treveleven Haysom who found the link. Apparently the daughter of Henry Tanworth Wells, Alice, married the son of the architect, George Edmund Street, who designed the church of St. James in Kingston. Treveleven also brought the whole picture to life by describing the characters and exactly what was happening so I have included this on the panel. It is to be placed at the Burngate Stone Centre with the approval of the National Trust and The Keystone Project. We will organise a working party to build the plinth with the stone kindly donated by Keates Quarry. We are delighted the Alfred Palmer Art Panel is now completed; it has been sponsored by David and Paddy Price-Hughes and depicts St. Mary’s Church, where they were married in 1956. It is in memory of her father, Dr de Jersey, well remembered in Swanage. This panel has been entirely produced locally, the pastel of St. Mary’s Church is owned by David Haysom who has generously allowed us to use the image. 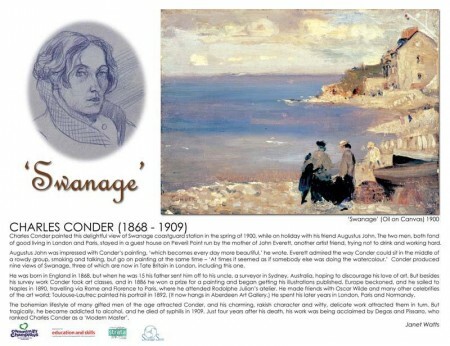 The self portrait is the property of the Swanage Museum and likewise they have let us use it. Richard Jeffery photographed these two pictures specially for the Art Trail and we have a lively biography of the artist, Alfred Palmer by renowned playwright & author Jeremy Paul. Paul Angel and Carlotta Barrow worked on the layout. The Reverend John Wood of St. Mary’s Church approves the panel and to site it on the railings by the steps, seems favourable. We are so thrilled to have this sponsorship from Cobalt Corporate Finance LLP, the specialist advisors in Technology, Media and Telecoms. You can read their statement below. Cobalt is delighted to be the major sponsor of Swanage Seen Art Trail which is a great asset to Swanage. 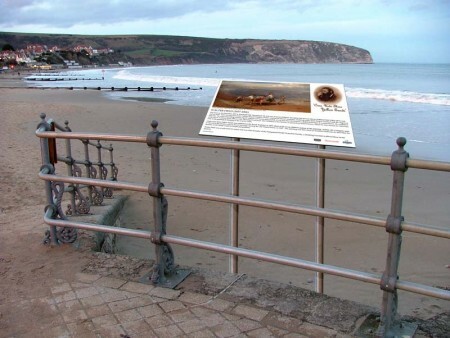 It illustrates the cultural richness of the Swanage area with work by internationally acclaimed artists; continues the educational legacy from Burt and the other Fathers of the town; and provides another strand for the evolving tourism strategy for Swanage and Purbeck – which can be activity based by following the Trail or passive by enjoying installations on an ad hoc basis. The Art Trail provides a sustainable historical context to the thriving contemporary arts scene.